In today’s busy world it’s hard enough to keep up with our own personal health, much less the health of a stream. However, our own health is very dependent on stream health, whether it be our physical health through the water we drink or our mental health through water we use for recreation. You might go to a doctor for your personal health, but when it comes to stream health the Kentucky Division of Water (KDOW) has the information you need. There are many ways you can get information about the health of a stream. One very handy way is to get the newly-developed Stream Health Pocket Guide. What is the Stream Health Pocket Guide? It’s a waterproof brochure that introduces you to a few of the things that can affect the health of our water; it tells you places you can go for more information on the health of your water; it even tells you how to collect your own stream health information, as well as things you can do to protect and improve the health of your stream. 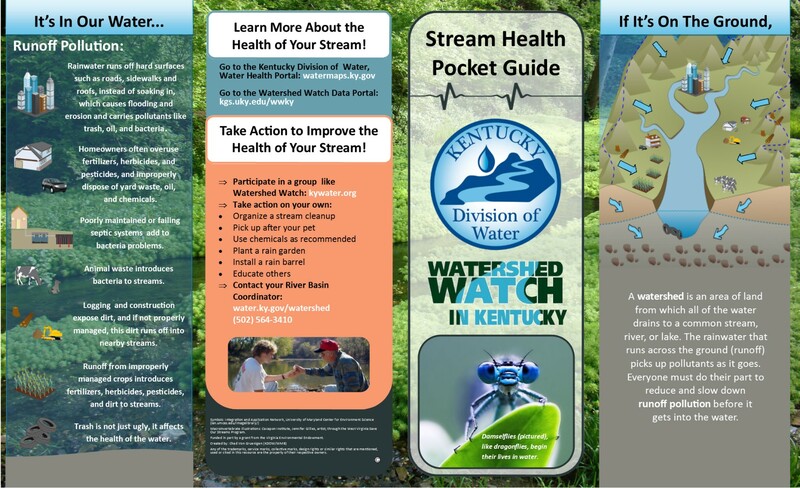 Get one free and learn a lot more at an upcoming Getting to the Bottom of Stream Health Workshop [PDF] during Water Week [PDF] in Kentucky. In addition to learning new and interesting things about stream health, you can become Project WET Certified at one of these workshops if you aren’t already. University of Louisville faculty from all disciplines and Graduate Teaching Academy participants will be exploring ways to weave sustainability themes into their classes by participating in an upcoming 2017 Green Threads workshop to be held in April. “Green Threads is a fantastic way to build your interdisciplinary network and discover new ways to integrate all that is happening in sustainability on campus into your students’ learning experience,” said Justin Mog, assistant to the provost for sustainability initiatives. The UofL Sustainability Council modeled Green Threads after the Ponderosa Project at Northern Arizona University and the Piedmont Project at Emory University. Its aim is to infuse sustainability across the curriculum in existing courses or in newly created courses focused on sustainability. Since its launch in 2009, more than 50 faculty from 30 departments have participated in the workshop and reached thousands of students through new and revised courses. Participants receive resources – including a $500 honorarium for faculty only – support and inspiration. “I was able to meet people who were very involved in sustainability here in Louisville, and learn more about folks I already knew,” said Daniel Decaro, who teaches in urban and public affairs, psychological and brain sciences and law. He took part in Green Threads in 2015 even though he was already teaching Behavioral Dimensions of Sustainability and Sustainable Social-Ecological Systems. The workshop was created by the University of Louisville Sustainability Council’s Education and Research Committee. Since it started in 2009, 53 faculty members from across the university have taken part. Among the units represented have been humanities; accountancy; political science; social work; urban and public affairs; law; psychological and brain sciences; biology; peace, justice and conflict transformation; communication; anthropology; geography and geosciences; fine arts; health and sports sciences; philosophy; business; teaching and learning; health promotion and behavioral science; honors; entrepreneurship; sociology; electrical and computer engineering; mechanical engineering; industrial engineering; English; justice administration; women’s and gender studies; economics and mathematics. Million Women Mentors Kentucky announce the 2017 MWM Stand Up for STEM Award [PDF] to recognize and elevate the work of incredible mentors, companies and organizations within Kentucky. Now is the time to identify the STEM mentors, both individuals and organizations, in your midst that deserve this distinguished honor. The award will be presented at the 2017 Kentucky Association of Manufacturers Conference & Trade Show, “Manufacturing Makes our Future,” on May 31 at the Lexington Convention Center. A 3D printed trophy created by Stratasys and a MWM award certificate will be presented to the winner by Kentucky Lieutenant Governor Jenean Hampton, honorary chair of MWM Kentucky. For consideration, please submit a nomination form [PDF] and letter supporting your nominee by April 30. Million Women Mentors supports the engagement of Science, Technology, Engineering and Math (STEM) mentors (male and female) to increase the interest and confidence of girls and women to persist and succeed in STEM programs and careers. Kentucky has a long history of caring for and protecting its abundant natural resources and one of the most important of these is water. The Commonwealth boasts a network of lakes, streams and rivers that are a vital source of drinking water, as well as a source of recreation for its citizens. In celebration of these abundant natural resources, and as an observance of the value of water to each of us in our everyday lives, Gov. Matt Bevin has pronounced the week of March 19-25 as Water Week [PDF] in Kentucky. A series of events meant to show how water health and conservation impacts each of us in our daily lives will highlight Water Week. Kentuckians can get hands-on with projects to protect or improve Kentucky’s water resources or simply learn more about subjects such as conservation and stream health. • reduction in water consumption. Read the full article on the Eastern Kentucky University website. Jackson said that the DOW staff will provide assistance in developing a GPP as part of the statewide survey, and said that all interested individuals and facilities are encouraged to call to schedule a field survey. According to Watershed Management Branch Manager John Webb, this will be a great tool to spread the word about the Groundwater Protection Program, which has been a Kentucky requirement since 1996. Two training days are currently being planned to give students an idea of the types of questions and activities that they will see in the competition. The training day for the western half of the state will be held at Saunder’s Spring in Radcliffe on March 24. The training day for the eastern half of the state will be held at Morehead State University on March 31. At the training days, the teams will rotate among the five topic stations to learn more about the test for that topic. They’ll get hands-on experience which will help them understand the topic better. For instance, at the forestry station, the students will learn how to correctly identify and measure trees. On Feb. 23, the Kentucky Energy and Environment Cabinet (EEC) recognized the Henry County School District for earning the U.S. Environmental Protection Agency’s (EPA’s) ENERGY STAR certification in all of the district’s five school buildings. Certificates signed by Governor Matt Bevin and Cabinet Secretary Charles Snavely were presented to school officials during the Feb. 23 meeting of the Henry County Board of Education. Henry County became the 18th school district in Kentucky to have 100 percent of its schools certified ENERGY STAR. Schools recognized during the board meeting were: Campbellsburg Elementary, Eastern Elementary, New Castle Elementary, Henry County Middle and Henry County High. Management of building operations and energy efficient geothermal heating and cooling systems, LED lighting and participation of student energy teams are credited for the schools earning the ENERGY STAR label. In the past year, the program has expanded to incorporate one of Kentucky’s largest sectors – agriculture. KY EXCEL Farm is open to all individuals and entities that conduct production, agriculture, having land and farming crops or livestock, or is an advocacy group for farmers/agriculture. KY EXCEL Farm membership is renewed annually upon conducting at least one voluntary environmental project. The possibility for projects is extensive. Membership in KY EXCEL Farm is for one year and can be renewed each year. Begin by submitting an EXCEL Farm Application and a Project Proposal form, both of which are available on the Division of Compliance Assistance KY EXCEL Farm website. There you will also find resources such as EXCEL Farm project ideas, a Kentucky Agriculture Water Quality Act Planning Tool and a Green Resources Checklist. Also featured are two Farm Spotlight stories – one on Capstone Farms [PDF] in Henry County, the first member of the KY EXCEL Farm program, and one on the Thompson Ag Exchange [PDF] on a Hardin County farm. David Neville of Henry County is a producer of Angus and Angus Cross cattle, which is not unusual in this part of the Commonwealth. What is different about Neville and his beef-producing Capstone Farms is that he uses 52 Kiko/Savannah cross goats for browsing brush control. Goats eat woody materials, some of which are harmful to cattle. Spraying chemicals to control toxic plants is expensive and harmful to the environment. Neville went organic with Capstone Farms, which comprises 258 acres of grassland, by accident. He did soil testing to see what the land needed for cattle. He thought about the environmental and financial costs of pesticides to use around fence rows and decided there must be a better way. That’s when he decided to try goats in his fields. After three years of using no pesticides, Neville’s farms have been certified organic. Farmers can use best management practices, be environmental leaders and have profitable operations at the same time. Vincent Thompson knows this. He lives and works on the Hardin County farm that his parents have owned since 1973. The farm is 160 acres, of which 40 acres are leased out to grow corn and grain. It is also the location of Thompson’s farm business, Thompson Ag Exchange and the Beck’s Hybrids seed dealership. Thompson sells and delivers corn, soybean, rye, wheat and red clover seeds to area farmers. Thompson, who is the current district supervisor and chairperson for the Hardin County Conservation District Board of Directors, raises 35 Charolois and Angus beef cattle, including 18 calves. The farm is also home to several breeds of goats, such as Boer, Lamancha, Sannen and Myotonic, or Tennessee Fainting goats. During his time on the farm, Thompson has seen farming techniques improve and searched for more ways to produce better beef cattle and meat goats, while introducing environmentally friendly practices. His latest project is to install three alternative water sources or waterers for his livestock and fencing around the ponds, creeks and sinkholes. Thompson learned that making small changes in water management and accessibility for livestock will yield improved results in animal health. When Thompson attended a farm best management practices seminar in Radcliff, he heard about KY EXCEL Farm. He joined the program and made installing waterers for his cattle and goats his program project. If you are interested in becoming a KY EXCEL Farm member, learn more by visiting the Division of Compliance Assistance KY EXCEL Farm website. PA has announced the winners of the 2016 Presidential Green Chemistry Challenge Awards. Green chemistry is the design of chemical products and processes that reduce or eliminate the generation of hazardous substances. EPA’s efforts to speed the adoption of this revolutionary and diverse discipline have led to significant environmental benefits, innovation and a strengthened economy. Read about the awards and learn more about Green Chemistry.